20 - 100 mm 15 - 168 mm Depending on pipe diameter. 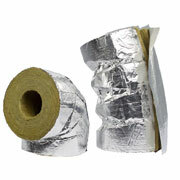 Aluminium foil reinforced with a glass fibre net. Tape fastening.